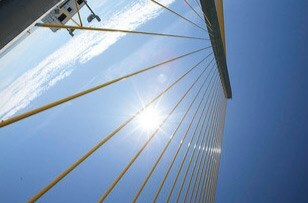 The Tampa Bay area has five main highways, four east to west main roads, and two north to south main roads. Here’s a guide explaining all of the roads and where to find them in Tampa. I-275: Runs right through the center and downtown Tampa. I-4: Comes from the east and stretches across South Tampa into St. Petersburg. Veteran’s Expressway (FL 589): This is a Toll Expressway. This highway runs north to south and stretches along West Tampa. 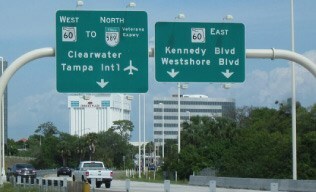 Tampa International Airport is around this highway; so expect that area of the highway to be in constant traffic. Leroy Semon Cross Expressway (FL 618): This is another Toll Expressway. This expressway runs across South Tampa. 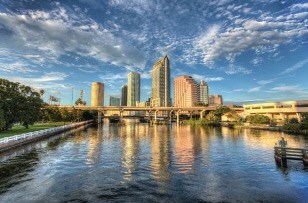 The University of Tampa and downtown Tampa crosses this highway, so keep a look out for traffic around those areas. I-75: This north-south expressway runs across East Tampa. I-75 is connected with I-4 and I-275 and helps you leave the Tampa Bay area altogether. Kennedy Boulevard (State Road 60): Connects with I-75 and Leroy Semon Cross Expressway. It runs along South Tampa, more north than Gandy Boulevard, and connects itself with St. Petersburg. Gandy Boulevard (US 92): Connects with Leroy Semon Cross Expressway and Gandy Bridge. It runs along South Tampa and St. Petersburg. Hillsborough Avenue (State Road 580): Connects with Veteran’s Expressway, I-275, and I-4. It runs along Central Tampa. Fowler Avenue (State Road 582): Connects with I-275. It runs along Northeast Tampa, specifically around the area of the University of South Florida. Dale Mabry Highway (US 92): Connects with Leroy Semon Cross Expressway and I-4. It runs along West Tampa. Florida/Nebraska Avenue (US 41): Connects with Leroy Semon Cross Expressway and I-4. It runs along East Tampa.